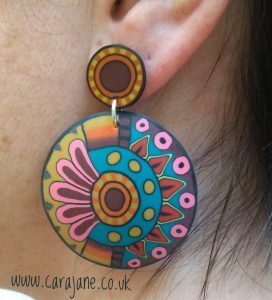 Home » blog » Big, bold and colourful earring fun! 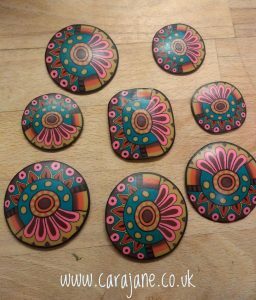 Here are some of my latest earrings. Small studs and some larger dangles. I made one big cane that started out round. It was about 10cm in diameter when finished it. Most of the colours were from the Pantone Fall/Winter 2018 collection colours with the exception of the bright pink. I am not quite sure what made me use the pink – it really isn’t my favourite as you will probably know if you’ve seen my other work! But I think it works in this cane. I reduced it to several different sizes and then decided it might look nice more square so reshaped part of it. 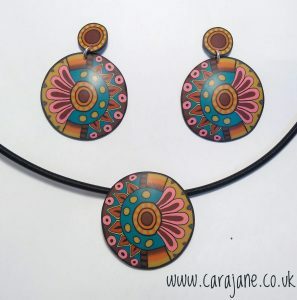 Here are some large round earrings and a pendant. 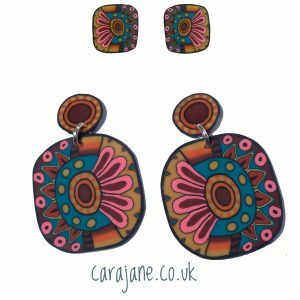 The earrings are pretty big and bold! 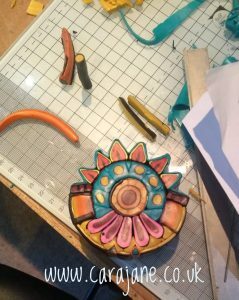 I have recently become the Vice President of the British Polymer Clay Guild, I look forward to helping spread the joy of polymer clay!